Prepare yourself for the feeling of more water with this 3 Setting H2Okinetic Showerhead in SpotShield Brushed Nickel. H2Okinetic provides a truly better shower experience. The warm, drenching water coverage is the result of a denser water pattern and larger droplets that retain their heat longer to soothe and revitalize. 8 Inch 3-Setting Rain Showerhead, Satin Nickel Prepare yourself for the feeling of more water with this 3 Setting H2Okinetic Showerhead in SpotShield Brushed Nickel. H2Okinetic provides a truly better shower experience. The warm, drenching water coverage is the result of a denser water pattern and larger droplets that retain their heat longer to soothe and revitalize. 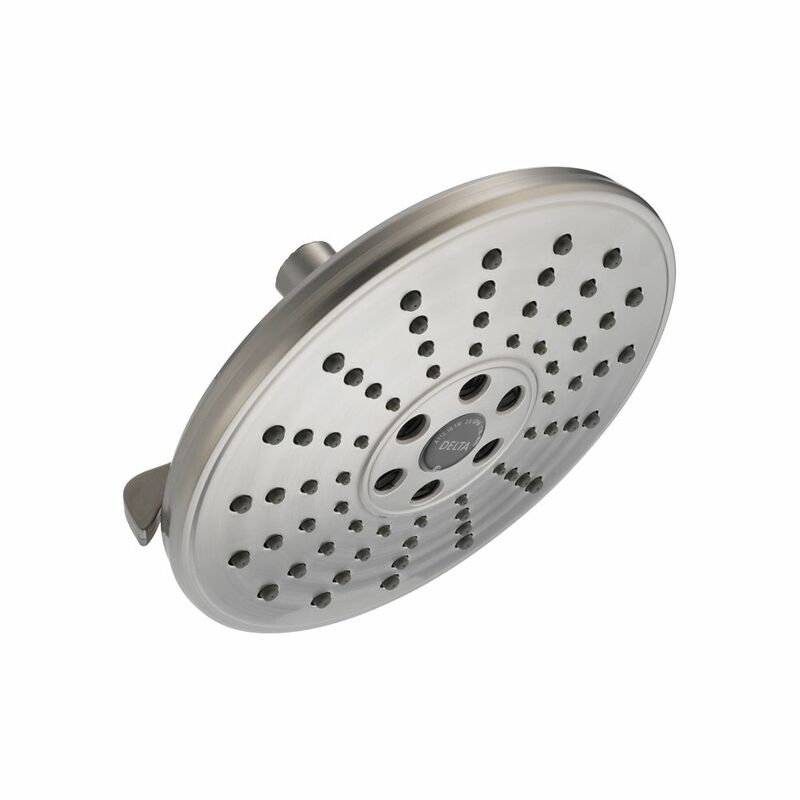 8 Inch 3-Setting Rain Showerhead, Satin Nickel is rated 4.1 out of 5 by 157. Rated 1 out of 5 by JR from I was expecting a more powerful spray but this is more like a gently rain shower and takes longer... I was expecting a more powerful spray but this is more like a gently rain shower and takes longer to get all of your shampoo or soap off. Rated 5 out of 5 by HomeDepotCustomer from Absolutely LOVE this shower head!! Absolutely LOVE this shower head!! Rated 5 out of 5 by Kelly from Perfect for the shower. Great pressure. ... Perfect for the shower. Great pressure. Rated 1 out of 5 by DrJ from I purchased this shower head for our master bathroom mini remodel (i.e. paint, tile, fixtures) wi... I purchased this shower head for our master bathroom mini remodel (i.e. paint, tile, fixtures) with high hopes. It is so bad, that I chose to go back to our 15 year old shower head instead while I search for a better one. It was taken back immediately. The lack of water pressure is embarrassing; instead of advertising it as a POWERDRENCH, power drizzle would be more appropriate. Never again. Rated 2 out of 5 by Lauren from It is much larger than expected and much less water... It is much larger than expected and much less water pressure than desired. Rated 2 out of 5 by Dissapointment from The outside ring of spray is as expected, ok-but I... The outside ring of spray is as expected, ok-but I bought this because of the inside ring, which on a model exactly (I thought) like this one purchased two years ago had a vibrating pulsating message type flow-now although looks exactly the same-has this annoying type messy splashy contorted flow of water that basically is worthless for massage. Fooled me. The description on the cover info is the same as before, but the product has been morphed. Rated 4 out of 5 by stf from Incredibly easy to install! ... Incredibly easy to install! Does this showerhead swivel or is it in a fixed direction?